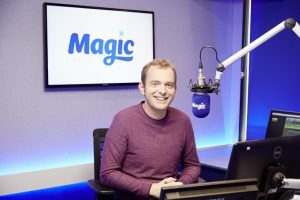 Current Magic Radio Breakfast show host Nick Snaith will now take control of mid-mornings on Magic as the station prepares to launch an all new weekday Breakfast Show with International recording artist, actor and presenter Ronan Keating and award winning broadcaster and current star of Magic weekend breakfast Harriet Scott. Harriet moves from her weekday breakfast slot, which will now be hosted by comedian and actor Tom Price as he is promoted from his weekday afternoon slot. Having performed regularly as a stand-up comedian and acted in a range of successful TV series – ITV’s smash hit ‘Victoria’, BBC’s Saturday night favourite ‘Torchwood’ and Sky 1’s ‘Stella’ – Price added national radio presenting to his impressively-strung bow back when he joined the station in October. Tom’s breakfast slots will see him mix his witty, energetic chat with his favourite Magic tracks, as listeners get ready for the day ahead of them on Saturday and Sunday mornings. Ronan and Harriet at Breakfast and Nick in his new role at Mid- Mornings will begin on Monday 4th September, and Tom will take control of weekend Breakfast from 9th September. Ronan, Harriet, Nick and Tom are in good company at the station in a line-up which includes the likes of writer and presenter Mel Giedroyc and world-famous singers Rick Astley and Kim Wilde.